Pioneer will soon launch a new car navigation system in Japan that uses dashboard cameras to scan the road ahead for approaching street signs and other cars, and will share images of road conditions with other vehicles. The company's new "Cyber Navi" system includes image recognition software to identify potential hazards like crosswalks, which it overlays with large warning icons on its LCD screen. 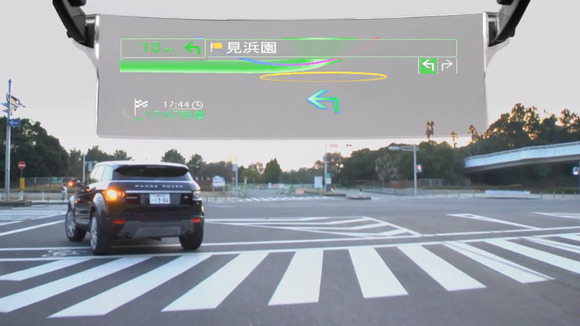 The system also tracks the car immediately in front of the driver, marking it with a large triangular symbol and calculating the distance between the two vehicles. When cars travel through preset locations throughout the country, Pioneer's system will automatically snap and upload images using its camera. These can be viewed by other drivers using the same system to check real-time traffic and road conditions. The preset locations will include notoriously crowded intersections, popular driving spots, and highway on-ramps, and more will be added on an ad hoc basis to cover traffic jams and other occurrences. Another component of Cyber Navi is a small projector that attaches to the ceiling of a car and creates a heads-up display for drivers that appears to float over the road. It is used to present driving instructions for navigation, and highlight nearby points of interest like gas stations and convenience stores with large floating icons. Pioneer has not yet revealed a price for the system, which will be released in June in several different versions. The heads-up display can be purchased separately for use with existing Pioneer car navigation systems for ¥105,000 ($1,000). All such systems will require a special wireless access point to connect to the Internet to share road condition photos and download newly updated map information. The wireless device runs on NTT DoCoMo's 3G "FOMA" network and costs ¥26,250 with three years of unlimited data.